The problem is that Holden Finn is a twenty-three-year-old pop megastar with his boy band, Every Which Way, and has no idea she exists. Not only that, but half the women in the world want to be Mrs Finn, including Bonnie’s teenage daughter, Paige. The real men in Bonnie’s life do nothing but let her down, but a man you can’t possibly have can never do that… right? 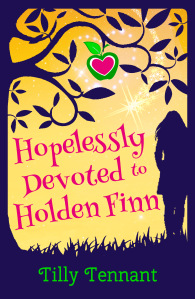 Hopelessly Devoted to Holden Finn is available as ebook and paperback from Amazon.